As many of my friends know, I love Cook’s Country Kitchen. I love it so much that I will watch the same episode twice in one night within 2.5 hours of each other! Yeah, weird, I know. But they do it right. So, this recipe is straight from the show. I love this recipe because, #1, it’s peaches, #2 it’s creamy and #3 it doesn’t have to be altered for high-altitude! If you like peaches like I do, you will LOVE this recipe. 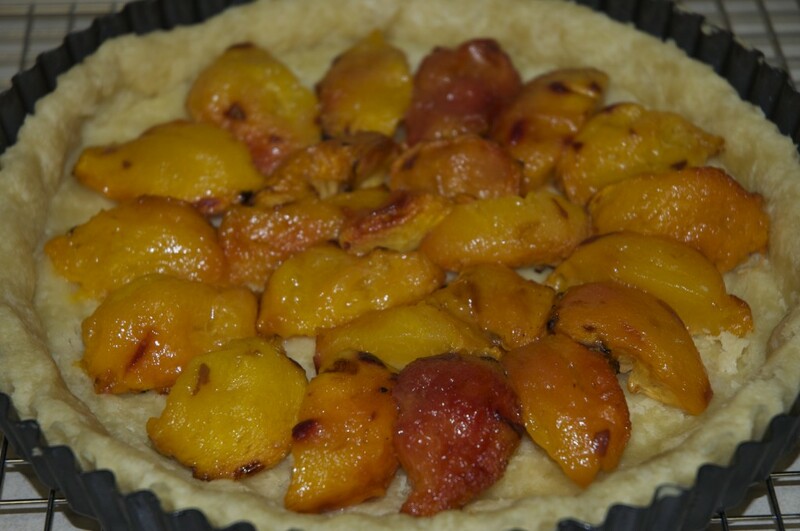 Yeah, the peaches are peeled, but worth the time of peeling and roasting as the roasting brings out a richer peach flavor, while helping to reduce the amount of liquid in the peaches so the pie is not too watery. 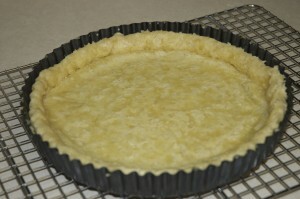 Chris Kimble said this pie, “. . . is one of the top 5 recipes of all time, and could be his all time favorite dessert and possibly solved his life issues.” Wow, I guess he really liked it. Perhaps that’s why I made it the next day. Removed peach skins with a serrated vegetable peeler. Slice peaches in half and remove the seed. 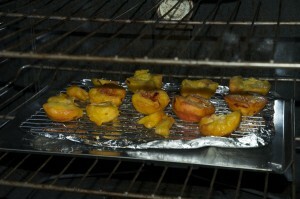 Place the peaches pit side up on a parchment lined or foil lined cookie sheet and sprinkle 2 tablespoons over the peaches. Place the peaches on the upper middle rack of a 375 degree oven for 50 minutes, flipping them over after 15 minutes. Remove peaches from oven and allow to cool. 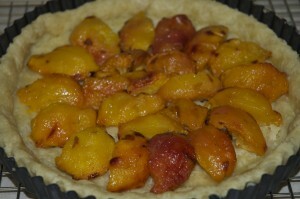 Once cooled, slice peaches in quarters and place peaches in the cooled pie-crust in a circular fashion. Set-aside. Mix the sugar, flour and salt and whisk together. 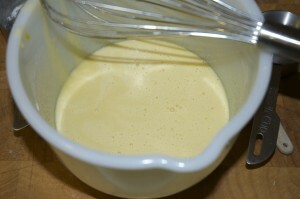 Add the heavy cream, 2 eggs yolks and vanilla. 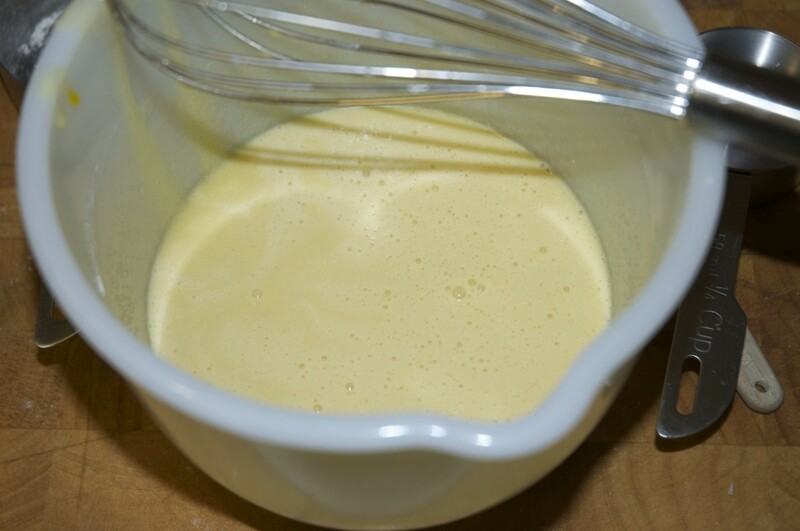 Batter will be cake-like. This is one of the best old time favorite pies. 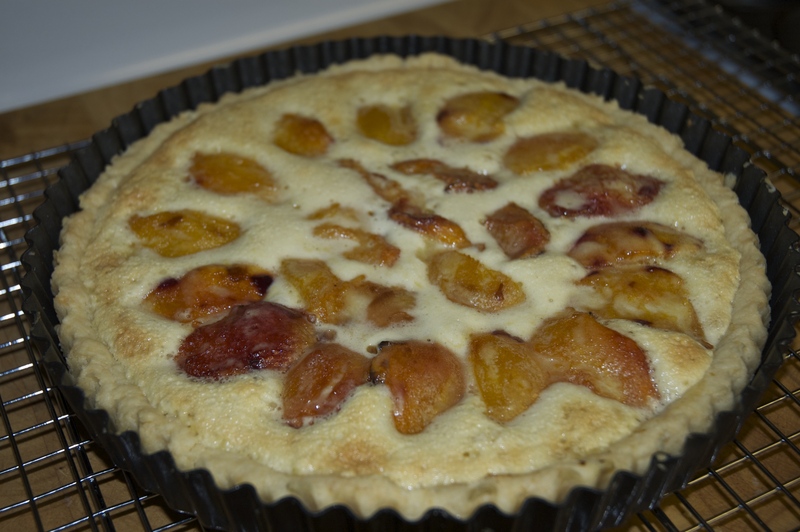 Peaches and Cream pie, made the old fashioned way with heavy cream, but improved with the two egg yolks to add creaminess to the batter preventing the custard from being too thin with today's "lighter" heavy cream. Step 3 Removed peach skins with a serrated vegetable peeler. Slice peaches in half and remove the seed. 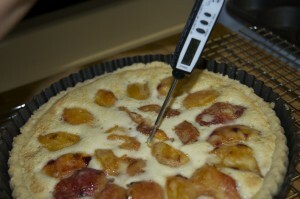 Step 6 Reduce the oven temperature to 325 degrees.